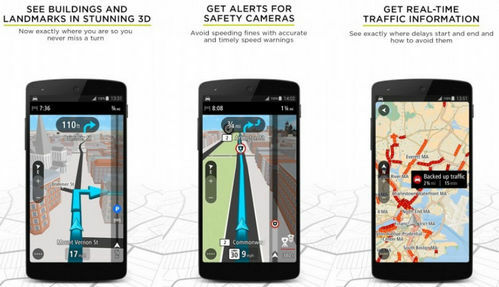 The premiere navigation app TomTom GO just got better. Let the app choose the best way to get you to your destination in the best possible time. When on the road you only need TomTom GPS Navigation Traffic, the best on the Android market (Apk available for download)! Scroll down to download the hacked/fully activated application package version of TomTom GO Navigation GPS Traffic for your Android! Android O support: The app is now compatible with Android O.
Destination prediction: Turn on this feature and the app will start learning your driving habits and predict when you're likely to drive to frequent destinations saved in My Places. It remembers the time of day when you make regular trips, so the more you drive with it, the more accurate its predictions will become. A commute will be ready right away with the latest traffic information. If you still need OBB file, here you go Download. 1) Install the app from Google Play Store. 2) Run it (until u get Map choice - optional), then close. No need to download maps at this stage. 4) Uninstall TT Go app from Application Manager (do not uninstall it with Google Store or other 3rd party apps). 7) Run the app and start map download. YOU ARE DONE! 8) If Map download fails or is stuck at 1%, copy the obb file saved above in Step 3 to the android folder Android/obb. Make sure it is on the right device, Internal memory or SD card. - If you have our previous release installed, you can install v1.17.7 over it without problems. Otherwise, uninstall, and re-install from scratch following instructions above. - If app seems to hang at the Tomtom start logo, just force close 'Go' and restart the app. Otherwise, uninstall, and re-install from scratch. - If voice instructions seem broken, Delete them & download them again. - If app force closes (FC), "clear Data" and it will work! - If you get Wi-Fi connection problem with maps, it is from tomtom servers, just try again many times and it will work. - You can always download an older version below if latest one doesn't work for you. You can use Osmand+ (on our site) to avoid having to redownload maps with each new update. If you have previous version Tom Tom Go v1.12.x from our site, you can probably install this new version over previous one without uninstalling. You have to install the original version from Play Store, uninstall and then install our apk (license until 2050/2100). Only one problem; whole Europe isn’t working. West and east works, but i can’t make one journey, you have to switch maps. Someone have the same problem? Or better, a solution? did u follow instructions completely?! try a clean install but follow instructions..
Link is dead, mirror available? link still working for latest version! I got only 50 miles/month. Be that as it may, on the off chance that you want to wander off into the obscure and esteem your opportunity, you may pick a unit which can be grabbed and carted with you as you wander away on that trail way. new update 1.13 is out!! give me few hours! Hoe kan ik nu controleren of ik de patch goed heb geïnstalleerd zonder eerst 75 km te gaan rijden? Help please i got now freemium license unthil 1/01/01 how do i fix this or is this normal? Zou graag willen weten of de 75 km limiet er écht uit is. Mijn vorige installatie (1.13) stopte er mee na 75 km..... Had écht de instructie opgevolgd. I use Osmand+ for off-road riding, but they use OpenStreetMaps. Can they be used in the TomTom app as well? I have freemium license 1/01/01. Successfully, installed and its working. Thanks but it shows 75 renew <<< What that means ! Please help. still no news on 75days Freemium? hi, i followed carefully the instructions (i had a previous patched version that i removed first, then reinstall version from playstore, then removed it from installer, then installed patched apk and obb). but when starting GO patched, "charging the app" with turning wheel does not stop. i tried to force close and reopen but still the same. any idea ? u didnt read instrucitons buddy, i said if u already have patched version, no need to reinstall, just install over it. so now as i installed everything on mobile memory it works fine. Doesn't work. Followed the instructions a few times and it's still stuck at " download paused" download will continue when your device is connected to a network" . Any suggestions? Yo estoy igual, con la descarga pausada. Y estoy conectado al WiFi. Alguien me puede ayudar? Muchas gracias por el trabajo realizado. Followed instructions for the 1.17 version. No dice. The app starts but when i select a map, any map, it hangs on downloading saying it is waiting for my device to connect. This finally works for me. 2 - launch app, go though settings, wait till list of maps appears. Don't switch off app at this point! 5 - install patched version from here. Don't launch it! 7 - now launch app, go to list of maps - and download which you want. Are you working on 1.17.1? Does it have Oreo support? Where is the patched version on here to download? Thanks, it worked in my Samsung galaxy S3.